Kills fleas and ticks for up to four weeks in cats. Contains fipronil. Cat - (3 pipettes). Kills fleas and provides tick control for up to 4 weeks. Always carefully read all packaging and information included with RSPCA FLEAaway™. Each pack will indicate what weight of cat or dog it is suitable for. Please weigh your pet before using RSPCA FLEAaway™. 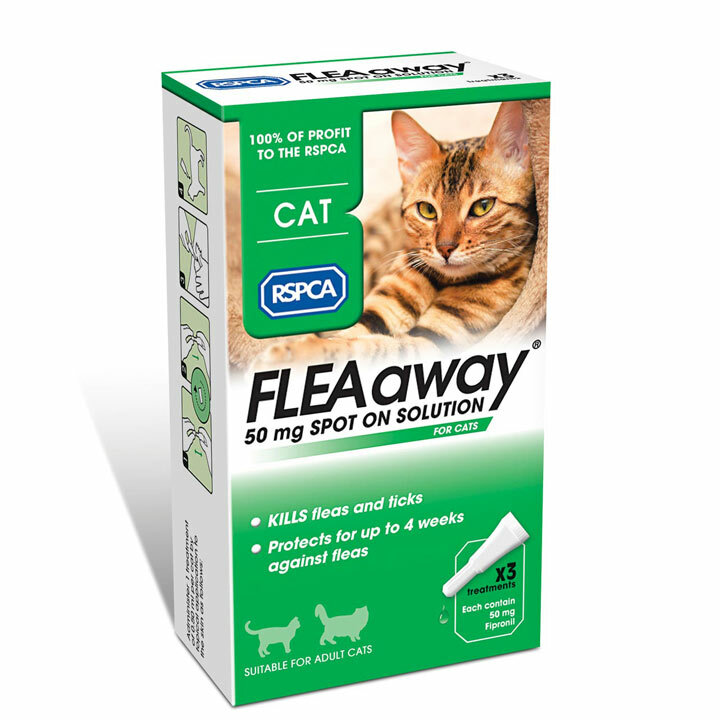 RSPCA FLEAaway™ 50mg Spot on Solution for cats has been specially formulated for use on cats and should not be used on dogs or rabbits. RSPCA FLEAaway™ is not suitable for use on kittens less than 2 months old or weighing less than 1kg. Do not use on sick or convalescent animals and do not use if your pet has a hypersensitivity to fipronil or the other ingredients. 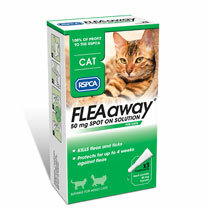 RSPCA FLEAaway™ is not recommended for use in pregnant or nursing cats. If you have any question or concerns please speak to your veterinary surgeon for tailored advice.